Sharks in New York Harbor? You can bet there will be this summer when several hundred swimmers (aka, sharks) descend there. What could be more sensational than swimming in the waters off the iconic Statue of Liberty, the most well known lady in the United States? 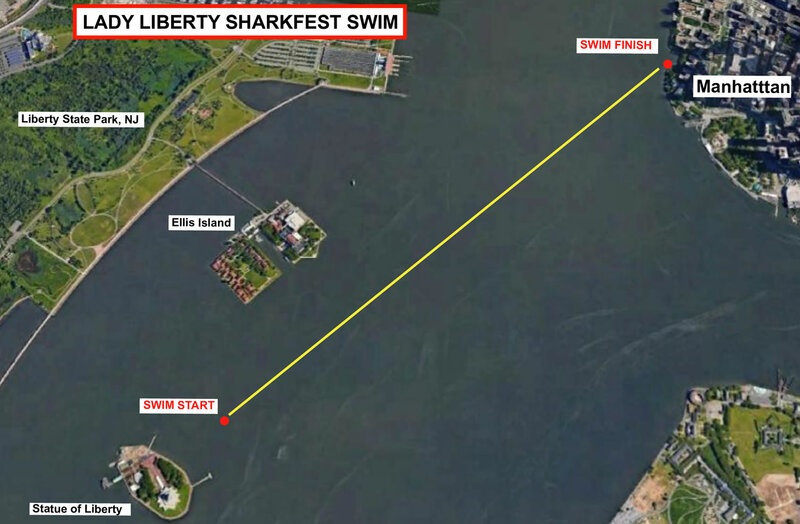 The swim will start just outside the security zone of Liberty Island and will go past the historic Ellis Island to finish at the south cove of Battery Park City with a view of the new Freedom Tower in the background. The ferry fee for swimmers is included in the entry fee. This swim is limited, so don’t wait too long to register for a not-to-be-missed event! What a wonderful opportunity to enter New York Harbor in the shadow of Lady Liberty. INCENTIVES: T-Shirts for all participants. Sharkfest Swim Medals for top three finishers in each age group (wetsuit & non-wetsuit combined). Personalized award plaques will also be mailed to the first place finishers in each age group (wetsuit & non-wetsuit combined). CANCELLATIONS: Registrations are non-refundable. If you can no longer participate in this event, you may receive a rollover credit (minus a $35 processing fee) toward a future event as long as you let us know by May 30 2019. After that date, a doctor's note is required to receive a credit. CLICK HERE to book online by Friday 6/1/19 to receive the discount rate (valid on 6/28, 6/29 & 6/30). $179/night (King Room, Two Double Room). 5:30–6:30AM: ATHLETE CHECK-IN will be held outside the Harbor House Restaurant at Pier A in Battery Park. You MUST BRING A PHOTO ID to pick up your swim cap and have your hands marked with your race number. 6:40AM: BOARD FERRY adjacent to check-in. 6:55AM: FERRY DEPARTS. Miss the ferry, miss the swim! 7:25AM: JUMP OFF FERRY starting at the first ferry horn blast. It takes about 5 minutes for everyone to get off the boat. The race will start approximately 1 minute after the last swimmer jumps off the ferry, so please swim to the paddleboard delineated start line as soon as you get in the water. 7:30AM: RACE START is signaled by the SECOND ferry horn blast at approximately this time. 9:00AM: Informal AWARDS CEREMONY will take place, announcing the age group winners (wetsuit and non-wetsuit combined) and handing out medals to those winners. Final results will be posted online at SharkfestSwim.com and personalized award plaques will be mailed a few weeks later. Post Race: Swimmers are encouraged to hang out with their friends and family at Battery Park. It's a great spot to trade post-race "war stories" from the swim while enjoying our spread of snacks, and the view from dry land.